Free Shipping Included! 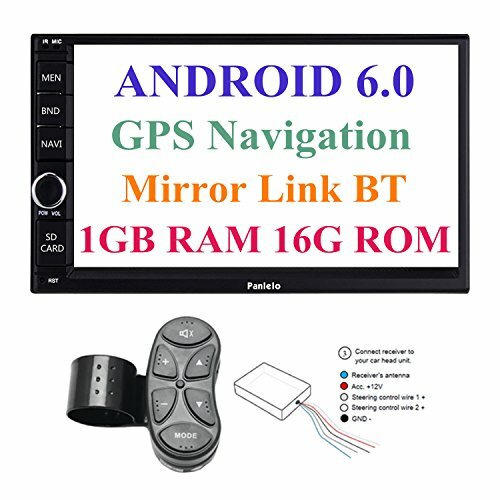 Panlelo PA012s Android 6.0 Car Stereo Double Din Car GPS Navigation 7 inch Car Radio Head Units Touch Screen BT WIFI Mirror Link SWC Quad Core 1GB RAM 16GB ROM AM/FM/RDS by Panlelo at All Seven Seater Cars. MPN: PA012swc. Hurry! Limited time offer. Offer valid only while supplies last. For Game Lovers: Newest Android 6.0 MARSHMALLOW System and Cortext A7 Quad Core 1.2GHz and 1G DDR3 RAM make sure quick response and fluent operation, which especially important when you play video games. What's more, 16GB LARGE MEMORY enables you download video games as many as possible. For Family Trip: Take a cinema and concert hall along with your trip. 1024*600 HD 7 INCH capacitive touch screen + Equalizer control + SUB input provides you with lossless picture and audio even if you are out of door. Support AM/FM/RDS, your family can listen to the funny radio shows during the trip and will not get bored. For Driving: Support GPS Navigation, both online map and offline map can be used. Real-time traffic condition and the quickest way are available to you when you use online map. Support Steering wheel control so that you can control the unit on the steering wheel without any distraction to guarantee driving safety. A universal steering wheel remote control is included in the package. For Business: IOS and Android users can use all the functions and application from phones on the 7 inch screen, including reading files, texting and video calls. After BT connection, you can use hands-free call so that you would not miss any important calls. Support WIFI and you can check the latest news on the Internet in car every morning. It is a universal 2 din car stereo with the size of 178x102mm/7.01"x4.01". Please make sure the size fits your car dash. If you not, you can search "installation kit" on Amazon to get one. Wiring is easy and you can search "Panlelo" on Youtube for video installation manual. If needed, please contact Skype (panle.lo) for help.